signed 'Magritte' (lower right); signed, dated and titled 'René Magritte (1950) "Le Sourire"' (on the reverse). Jean Bourjou, Brussels, by whom probably acquired directly from the artist. Micheline Hendrickx-Delattre, Brussels, by whom acquired from the above. Private collection, Germany, by whom acquired from the above in 1986. Exh. cat., Surréalisme et peinture, Basel, 1974 (illustrated). A. Bonito Oliva, Art's Matter: Between Surrealism and American Painting, Rome, 1979 (illustrated p. 68). D. Sylvester (ed. 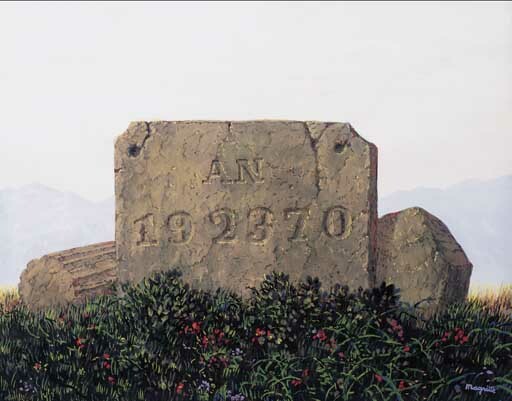 ), René Magritte, Catalogue raisonné, vol. IV, Gouaches, Temperas, Watercolours and Papier Collés, 1918-1967, Antwerp, 1994, no. 1319 (illustrated p. 136). Possibly Brussels, Galeries Dietrich et Lou Cosyn, Exposition Magritte, April 1951, no. 22. Brussels, Galerie Isy Brachot, Magritte: cent cinquante oeuvres, première vue mondiale de ses sculptures, January - February 1968, no. 165.